Are you K1NG OF SPEED?! The competition begins with 16 available Drivers. Each Driver races against another Driver in Round 1, consisting of two 14 lap heats. After Round 1 eliminations, the 8 remaining Drivers are paired up to race two 10 lap heats in Round 2. After Round 2 eliminations, the 4 remaining drivers will advance to Round 3, consisting of two 8 lap races. 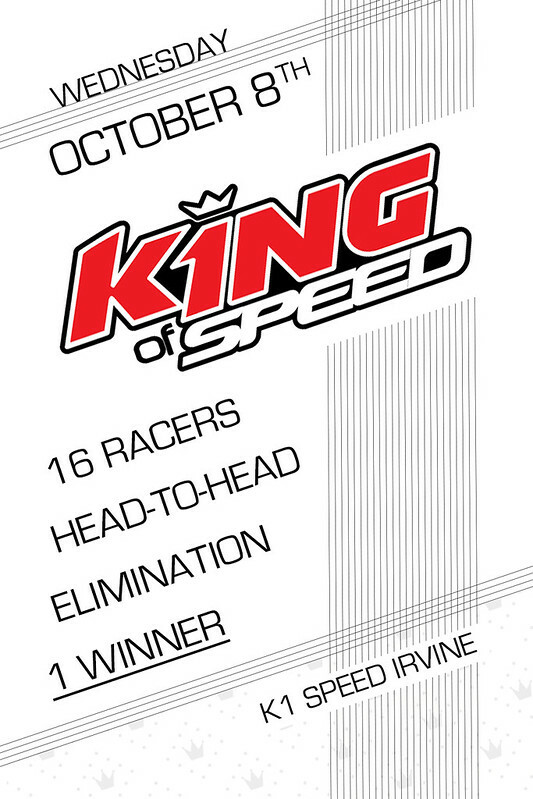 After Round 3 eliminations, the two remaining Drivers race head to head in two 6 lap races, with the winner crowned “King of Speed”. The elimination process works by pairing racers through random selection for a given round. The round consists of 2 race heats; first in assigned karts and then a second heat where the drivers swap karts from the first heat. The driver with the best average time between the 2 heats will advance to the next round. First come, first serve. Only 16 race spots available.